Home Campus Central Fire in Hansraj’s Chemistry Lab: How Safe are our Colleges? A fire broke out in the Chemistry lab of B-block in Hansraj. The cause of the fire has been subject to multiple interpretations. No injuries have been reported so far. The chemistry lab in Hansraj College’s B block caught fire today.The incident occurred between 12 noon and 1 pm, in the newly constructed Dr. Rathi’s lab located in the B Block of the college.With scattered debris, pungent fumes, ashes and some shards of broken glass, Dr Brijesh Rathi, a professor of Chemistry claimed that the situation was immediately under control with the help of vigilance of the students present. He also added that the disaster was averted because of the solvent chamber being outside the lab. The alleged cause of the fire was electric sparks from a wire which resulted in a plastic tube burning, however multiple narratives have come up with some claiming a short circuit in the lab.A first year Chemistry student whose class was adjacent to the lab says, “We heard screams alerting others of the fire, we saw the fumes and were evacuated immediately from our classrooms”.Fire trucks and ambulances rushed to the scene immediately. No injuries have been reported so far. The students were reportedly outside the lab when the mishap occurred. Our correspondent was repeatedly declined permission to take pictures of the damaged lab citing toxic fumes but given the discrepancies related to the cause of the fire and the administration soft response, this raises the questions, are our colleges really fire-safe? Do they have a valid NOC? Are there adequate number of fire extinguishers in the colleges of Delhi University?Is our infrastructure safe? 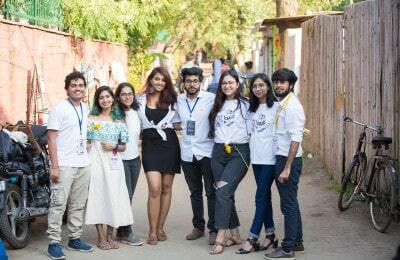 Previous PostBeing a first time voter, what to keep in mind Next PostZaeden Closes the Second Day of Reverie'19!